Experience the therapeutic benefits of high potency vitamins via an IV drip. Watch the video : What is high potency IV vitamin therapy? Discover the scientifically proven health benefits of injected and intravenous high potency IV vitamin therapy, used by millions around the world to treat chronic and acute conditions. On a Physiological Level… What is Life? Your body is comprised of approximately 37 trillion cells. Every cell is a biochemical factory, working at full capacity 24 hours per day. Every cell is conducting approximately 2,000 chemical reactions per second! Every biochemical pathway is dependent on specific enzymes and co-factors such as vitamins and minerals. If you don’t have critical compounds, vitamins and minerals in your system, trillions of biochemical pathways are NOT working as well as they should, every second of every day and night. IV therapy is at least 100 times more effective than pills and “eating right” at getting the critical elements that you need for optimum health and vitality. What is High Potency IV Vitamin Therapy? 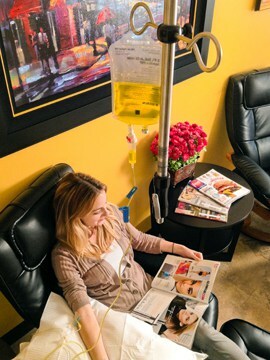 High potency IV vitamin therapy is a method used to effectively deliver safe and healthy doses of minerals, natural vitamins, and amino acids directly into the patient’s bloodstream via an IV drip. It also goes by the terms Injected Intramuscular (IM) or Intravenous (IV) Vitamin therapy. Why is IV Therapy Effective? High potency IV vitamin therapy gets its effectiveness from its ability to bypass the patient’s digestive system completely. This is accomplished by directly administering our unique combination of high potency vitamins, minerals, and amino acids into the patient’s bloodstream via an IV drip. When we ingest vitamins, minerals, and amino acids through the mouth and allow them to enter the digestive system, only a small amount- typically about 10%- of their therapeutic benefit is absorbed via the digestive system and put to use by the patient’s body. This means that high potency IV vitamin therapy is by far the most effective and efficient method to deliver the therapeutic benefits provided by natural, high potency vitamins, minerals, and amino acids. It also supports the physiological transformation of you skin after a non-surgical face lift. In addition to helping support your skins ability to regenerate, high potency IV vitamin therapy has many other health benefits. For instance, Vitamin B12 Injections can actually boost energy levels and ramp up metabolism so you burn more fat. In addition, your liver uses vitamin B12 to process fatty and amino acids which is part of the detoxifying process. High-dose vitamin C has been used in cancer treatment for decades for its anticancer properties with very few side effects. In addition to aiding the healing process you are also improving your overall health. Patients receiving IV vitamin infusions often tolerate certain ailments much better. It is believed that adding this complementary vitamin therapy can enhance the effect of conventional therapies. Non-Surgical Facelift PR3 protocols engage your skin’s inherent physiological capacity for Repair, Regeneration and Rebirth. Simply put, your skin will rebuild or rebirth itself as it did when you were much younger. This requires lots of energy, the necessary biological substrates and abundant nutritional support to reach its full potential. For example, collagen synthesis requires vitamin C and specific amino acids. We can effectively administer these by IM & IV therapy. As a result of that, it boosts your physiology’s ability to respond to our PR3 protocols and produces a better result for you. With proper vitamin injections, collagen generation and remodeling can continue for up to 18 months. This treatment is for patients with malnutrition and/or weight loss. IV drips or pushes for heavy metal removal. Contains Sodium-EDTA, Calcium-EDTA, or DMPS depending on the doctor’s recommendation. Pushes are also used for simulated heavy metal tests. This treatment is designed for patients with memory loss. Contains high dose vitamins and minerals and the amino acid Acetyl-L Carnitine. The detoxification drip is used in some patients participating in a detox program. It contains specific nutrients and vitamins used by the body in detoxification. This treatment is used in detoxification, liver disease, lung disease and autism. Glutathione is a peptide antioxidant synthesized in liver from three amino acids. It is used in the detoxification of drugs and other compounds before they are removed as waste. The Immune Drip contains high-dose vitamin C in 12.5 25, 50, 75 mg strength along with other vitamins and minerals. This drip is prescribed for general immune support, before/after surgery or travel, and during illness or injury. Used for neuropathy, diabetes, liver disease. Lipoic acid is an antioxidant compound that regenerates other antioxidants, including vitamins C, E and CoQ10. It is also useful in stabilizing blood sugar levels. Lipoic acid may also be added to other IV therapies as requested by the doctor. Contains nutrients that support vision and ocular function for those with macular degeneration. Can also be used in those who wish to support visual function. Used for hypertension, asthma, or cramps. Magnesium relaxes muscles and helps reduce blood pressure. An IV push used for infection. Can be used in place of an immune drip if a patient has limited time. Contains vitamins, minerals and antioxidants. An IV push containing an additional homeopathic agent for used in patients with migraine headaches. Used in patients who suffer from anxiety, drug withdrawal and detoxification and can also be beneficial for those with depression. Contains high-dose vitamins, minerals. Used in patients with autoimmune diseases, joint pain, scleroderma, or lupus. MSM (methylsulfonylmethane) is a naturally occurring sulfur compound that can be beneficial for those with inflammatory conditions. 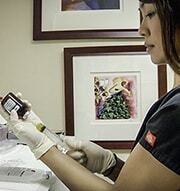 An IV designed specifically for professional athletes and patients with poor glucose control. Contains extra vitamin C and glutathione. Available in several strengths. Used in patients who have had dental amalgams removed. Contains antioxidants and minerals. A basic saline infusion for those with dehydration. Used for Herpes zoster (shingles), Herpes simplex (cold sores, genital herpes). It contains vitamins and minerals along with the amino acids Lysine and Proline. Used in patients pre and post surgery. A drip containing high dose vitamins and minerals along with specific amino acids used to promote healing. Patients report improved healing and quicker recoveries after surgery.